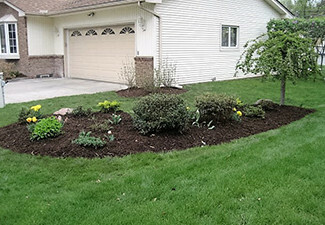 We specialize in new home landscapes and re-landscaping projects. Our design team has unique ideas that are beautiful, functional and economical. We pride ourselves in our full service services, including irrigation, brick paving, final grading, retaining walls, low voltage lighting and sod. When you meet with a salesman we can review our portfolio for design ideas or just take a drive through the area. We have hundreds of new home landscapes within a few mile radius of our office. When you hire Squeals we will start your project on time and our installation team will ensure no inconvenience to you or your neighbors; every crew has a supervisor on site from start to finish. Our talented staff pays attention to specific details on the job creating not only an amazing landscape, but also a true work of art. Remember to ask about our specially-designed low maintenance landscapes. For extra convenience, we accept all major credit cards with a small service charge. 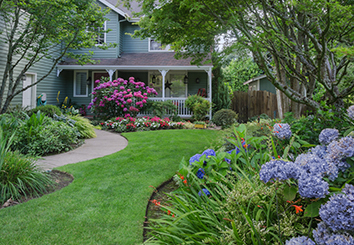 Landscaping is usually thought of as a source of beauty, but its benefits go far beyond the aesthetic. Whether for public buildings, recreation centers or individual homes, professional outdoor designs can make a space safer and more accessible. As a landscape architect with extensive experience in the Metro Detroit area, Squeals Landscaping can complete even the most elaborate residential and commercial projects. Home Enhancements - The Squeals team is proud to help new homeowners make their mark on their first abode. We also work with more established residents, allowing them to give an existing property new life. Water-front Work - Squeals Landscaping has worked on lakefront properties, pools and an array of other watery environments. We add beauty without disrupting the natural aquatic ecosystem. Poolside Landscaping - We provide exceptional plant design around your swimming pool, creating a unique atmosphere that you and your guests are sure to love. Though we often call ourselves designers, Squeals Landscaping does not actually come up with the designs. Rather, we visit your property, listen to all of your ideas, and develop a plan to put the designs you have envisioned into practice. Our goal is to give life to your creative impulses, not to impose our own landscaping ideas on you. The Squeals team has a strong background in plant biology, allowing us to select only the healthiest and most beautiful trees, bushes and shrubs. We can also assess your yard, determine soil characteristics and water sources, and figure out how to ensure that the plants will thrive there. We offer free estimates for all of our work and cover the finished product with a comprehensive warranty. We work with the city and/or DEQ to make sure all work is in compliance with local and state requirements. If landscape plans are provided, we can bid and often suggest recommendations as ways to save money. Many landscape architects design great work, however, a reasonable budget is often overlooked. This is where Squeals can help. As a major purchaser of plant materials, we know how availability, pricing and value can make a world of difference. Since our irrigation crews work closely with our installation crews, we can guarantee you won’t have to take time out of your busy schedule to worry about the survival of your plant material. The team at Squeals Landscaping Inc. has years of experience in giving businesses' exteriors a facelift. Simply adding in professional greenery and/or flowers can drastically increase a business's curb appeal, giving it a more reputable look. Prospective customers appreciate when a company takes pride in its atmosphere, and are thus more inclined to give their patronage. We begin our process by meeting with you to discuss your design ideas. We will then focus on creating a landscape that enhances your brand's identity, keeping our communication open with you throughout the design and installation processes. We have strict quality standards (and we know you do, too! ), so we will always work diligently and with the best plant material available on the market. The end result is a landscape that you and your customers are sure to be awestruck about! Financial Benefits - Beautiful and unique landscape designs will add value to the property where they are installed. In this sense, landscaping is not a service you purchase for your property, but rather an investment you make in its enduring value. Safety & Security - Proper landscaping can remove visual obstacles and hazards, making it easy to walk through a property safely. It also helps you detect intruders, whether human or animal, that make it into the space. Enhanced Accessibility - Proper landscaping makes it easy to move around a property, enhancing the experience of guests who are not familiar with the terrain. For more information on artistic, affordable designs in Commerce Township, contact Squeals Landscaping at (248) 360-7000 today.